North Korea has been ruled by one of the most repressive totalitarian regimes on earth. Millions of North Koreans have been starved to death and sent to concentration camps to die in inhumane ways not seen since the days of Hitler or Stalin. The extent of human rights abuses, a list too long to go into great detail, are deliberate and calculated actions utilized by the Kim regime to quell dissent and maintain ultimate control. Kim Jong Un rebuked the military for having many political schools that practice “Hailing Yang, while practicing Yin.” This phrase means that they “pretend to obey but secretly betray.”Kim Jong Un ordered the eradication of “aberrant lifestyles,” in which people view and listen to “impure materials,” but according to a North Korean source, interest in and desire for different cultures is spreading in the country. The Democratic People's Republic of Korea (North Korea or DPRK) is a Communist state with an underdeveloped economy, but a powerful military, situated on the Korean peninsula between northeast China and the Republic of Korea (South Korea). North Korea limits trade and transportation links with other countries and tightly restricts the circumstances under which foreigners may enter the country and interact with local citizens. Telephone and fax communications are unavailable in many areas of the country, and foreigners can expect their communications to be monitored by DPRK officials. In recent years, North Korea has experienced intermittent famine, chronic fuel and electricity shortages, and outbreaks of disease. Many countries, including the United States, have contributed to international relief efforts to assist the people of North Korea. The DPRK adopted Marxism-Leninism as its ruling philosophy when it proclaimed its establishment in 1948, but in a Constitutional revision in 1972, supplemented it with the juche ideology, or national self-reliance. The two philosophies were combined into one as "the juche idea of the Worker's Party of Korea, a creative application of Marxism-Leninism to the conditions of our country". In 1980, the official ideology was simplified as "the juche thought of the Great Leader, Kim Il-Sung". 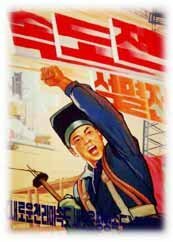 According to the DPRK Constitution, juche is "a revolutionary ideology with a people-centred view of the world that aims to realise the independence of the masses, the guiding principle of its actions". Juche consists of two parts: the philosophical theory that claims the masses are the masters of history and the revolution, and the principle that the masses need the guidance of a leader (Kim Il-Sung and his son, Kim Jong-Il) to fulfil their destiny. In practice, juche resulted in an inward looking economic and political system that ostensibly rejected international trade, but in reality became heavily dependent on the provision of goods on favourable terms from fraternal socialist states. With the demise of the communist bloc, the difficulties of this position soon became apparent. Shortages in spare parts, fuel, and food have grown but the isolationist ideology of juche continues to underlie all government policies and emphasis remains in advancing an independent road to national development. The population is motivated to pursue juche through an intensive ideological campaign and a pervasive programme of political indoctrination. Since its inception, juche has primarily stressed independence from external powers, but the regime now faces the dilemma of how to expand trade and investment with the outside world in order to resuscitate the economy, without jeopardising its political stability. The "Military First" orientation has always been the heart and soul of the North Korean regime. It provides the only conceivable means by which the regime can survive and achieve its ultimate security through reunification. The military continues to grow in both conventional and asymmetrical forces with increasing emphasis on the latter. The military provides deterrence, defense, and a massive offensive threat, as well as leverage in international negotiations. The army is much more than just a military organization; it is North Korea's largest employer, purchaser, and consumer, the central unifying structure in the country, and the source of power for the regime. In August 1945, the Japanese in Korea surrendered to the former Soviet Union, which gained control of the Korean peninsula south to the 38th parallel. In August 1948, supposedly following general elections throughout the peninsula, the DPRK was established, with Kim Il-song heading the central government. These factitious elections are the basis for Pyongyang's claim as the only legitimate government of Korea, and Pyongyang has made a national goal of reunifying the country on its terms. In pressing this claim, the DPRK has engaged in a political, economic, and military competition with the Republic of Korea (ROK). However, in any comparison except military power, Pyongyang is a poor second. On Saturday, 24 June 1950, DPRK forces invaded the ROK. The United States, acting with a mandate from the UN, took the lead in defending the ROK. The Chinese entered into the fighting, and the war's inconclusive end led to a return to the status quo at the 38th parallel. An armistice, signed in July 1953, was followed 2 months later by the signing of a mutual defense treaty between the United States and the ROK. The country is facing insurmountable internal problems and is unstable politically, economically, and socially. The Government of the Democratic People’s Republic of Korea (DPRK or North Korea) continues to commit serious human rights abuses, including extrajudicial killings, enforced disappearances, arbitrary arrests and detention, forced labor, and torture. Many of these abuses are committed in the country’s political prison camps (kwanliso), which hold an estimated 80,000 -120,000 prisoners, including children and family members of the accused. The government also maintains an extensive system of forced labor through its rigid controls over workers, and restricts the exercise of freedoms of expression, peaceful assembly, association, religion or belief, and movement. Various political setbacks have further isolated the DPRK and include the 1990 formal recognition of the ROK by the former Soviet Union, and the 1991 entrance of both Koreas to the UN. The DPRK lost one of its major supporters with the demise of the Soviet Union. Moreover, although the People's Republic of China (PRC) remains the only credible supporter of the DPRK, economic and political rapprochement between the PRC and the ROK continues. The DPRK will continue to be both economically and socially repressed and will become increasingly isolated. The DPRK will likely cling to its outmoded style of communism and political change will not occur until the current leaders are gone. On June 19, 2000, the US eased economic sanctions against North Korea. Imports from North Korea are allowed, subject to an approval process. Direct personal and commercial financial transactions are allowed between US and North Korean citizens. Restrictions on investment have also eased. Commercial US ships and aircraft carrying US goods are allowed to call at North Korean ports with prior clearance. Although modified periodically since 1995 as a result of commitments made to begin normalization of relations, US economic and financial sanctions against North Korea -- administered by the US treasury department -- remain in force. They affect all US citizens and permanent residents wherever they are located, all people and organizations physically in the united states, and all branches, subsidiaries and controlled affiliates of US organizations throughout the world. Negative economic growth, chronic shortages of raw materials (especially oil), ineffective centralized economic planning, and an emphasis on military power contributed to the economic failure of North Korea. The requirement by Russia and the PRC that materials exported to the DPRK be paid for with cash further degraded North Korea's economic viability. The DPRK can no longer generate sufficient electrical power to meet industrial needs, social services have been severely degraded, and segments of society have been reduced to one meal a day. There are chronic shortages of many of the basic commodities required for subsistence and industrial production. Critical resources continue to be dedicated to the military with increasing detriment to the economy. There will be no relief from the severe shortages, which could foster growing dissatisfaction among the intelligentsia, workers, students, and bureaucrats. 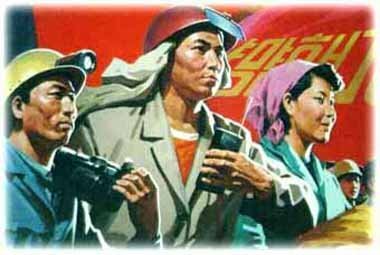 The DPRK's management of its economy provides no freedom of action for producers, real incentives for individuals to excel, or a government responsive to scientific and technological progress. If the DPRK keeps its emphasis on its military and does not reform its eco-nomic system, the country could eventually be in grave danger of imploding. The DPRK is, and will likely remain, one of the most dangerous countries in the world. With its external reputation for worst-case socialism, in the 1990s most observers thought North Korea would go the way of the Stalinist states of Eastern Europe and collapse. Some thought East Germany would be the model, with North Korea folding up and embracing a new unity with the South. Others suggested the example of Romania, where Nikolae Ceausescu had modeled his dictatorial rule on Kim Il Sung’s. The “revolution of 1989” was so unexpected as to breed humility into all observers of socialist states, but, so far, North Korea has not followed the East German path. It was Mikhail Gorbachev who reined in the military there; amid the widespread demonstrations against Erich Honnecker’s regime, Gorbachev kept the 360,000 Soviet Army troops in their barracks. North Korea, however, has an independently controlled army estimated at 1.2 million strong, and most of the pressure the Soviets could exert had been applied (overall Soviet aid to P’yongyang declined precipitously after Gorbachev took power, although military aid continued). In the early twenty-first century, the North reportedly has trafficked in illegal narcotics and counterfeit currency. Korea’s main difference from Eastern Europe was that it suffered a terrible civil war, with some 4.5 million killed, in recent memory. The North probably suffered nearly 2 million casualties. There also were 1 million Chinese casualties. It was very hard to believe that military commanders who fought the South in a bloody civil war would allow South Korea to overwhelm North Korea, by whatever means. If North Korea’s socialist system collapses under intense international pressure, probably the apparatchiks will declare themselves to have been nationalists all along (with some measure of truth) and try to keep their hold on power. In April 2016 the Government called on the citizens to prepare for a new "arduous march." The term was first coined by the North Korean leadership in 1993 as a metaphor for the four-year famine that decimated the nation from 1994. The famine - in which as many as 3.5 million of the nation's 22 million people died - was brought on by economic mismanagement, natural disasters, the collapse of the Soviet bloc, and the consequent loss of aid, combined with the regime's insistence on putting the military first. Acute respiratory disease common cold, flu and bronchitis may be more dominant during winter seasons. (December ~ February) No human case of SARs and Avian Influenza has been reported so far in DPRK. Diarrheal Disease is also common during summer months. The main casuses being poor water quality, lack of sanitary facilities and poor food storage. However, Pyongyang city and the hotel facilities strictly observe the sanitation standards, causing no harms to the foreigners. Only boiled water should be used for drinking, bottled water is also available in most cities.